Will there ever be a 'desktop-class' DAW for the iPad? 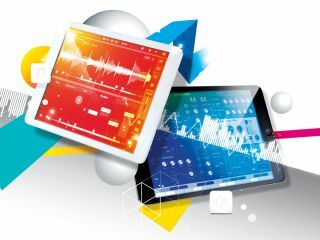 Will the iPad ever become your main music making machine? "It's fair to argue that iOS is less capable than a typical desktop setup in terms of both processing power and plugin functionality, but these are issues which could be solved by future hardware and software improvements. "Tablets use a touchscreen interface to give a 'hands-on' feel, and desktops use a mouse/keyboard interface suited to high information density. iOS will erode some applications which were once desktop-only, but it will never be a complete replacement while mobile and desktop continue to be two different things." "In the early iPad days, there simply wasn't enough horsepower to do everything we wanted, but with each new iPad, that gap gets smaller. The next major version of Auria will really raise the bar - some features in the pipeline now wouldn't have been possible just two years ago. Touchscreen interfaces are a very intuitive way to mix and edit music, while the portability of the iPad makes it ideal for capturing musical inspiration 'where it happens'." "The iPad is certainly powerful enough for this. In fact, it's already many times more powerful than the desktops that many DAWs evolved on. Part of answering this question is trying to decide if it should ever get a desktop-class DAW. In many ways, iPad represents an opportunity to explore new forms of creativity - you can interact with virtual instruments far better than with a mouse, while manipulating lots of little notes in a piano roll is still better on the desktop. "We believe that iPads can run professional-level music creation tools, but whether these will look like a DAW or something else is yet to be seen." "When we first launched our Cubasis DAW for iOS, the situation was similar to that of the desktop market in the 90s, when hardware limitations had a dramatic effect on the performance of software. However, technology such as Inter-App Audio and Audiobus, and hardware improvements, are helping us to push forward with DAW development on the iPad." "Right now, the only limiting factors are the software and the interface. On the software side, I'd say we're getting closer, but we still haven't seen the killer app. Trying to make everything work on a small touchscreen interface will always be a challenge, and maybe it's OK if mobile DAWs don't include every feature that the desktop DAWs have. I could envision a future where all the big DAWs have mobile apps that will let you continue working on your desktop song on a tablet using a simplified interface."